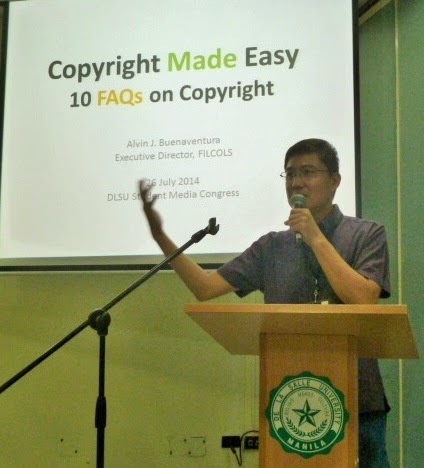 “Respect for copyright is respect for the human rights of authors,” said Alvin J. Buenaventura, executive director of the Filipinas Copyright Licensing Society (FILCOLS), before some delegates of the De la Salle University (DLSU) Student Media Congress last July 26. Buenaventura’s talk “Copyright made easy: 10 FAQs on Copyright” explained the basics of copyright without the legal jargon. He spoke in Filipino and used everyday examples the listeners are familiar with to make the concepts easy to understand. 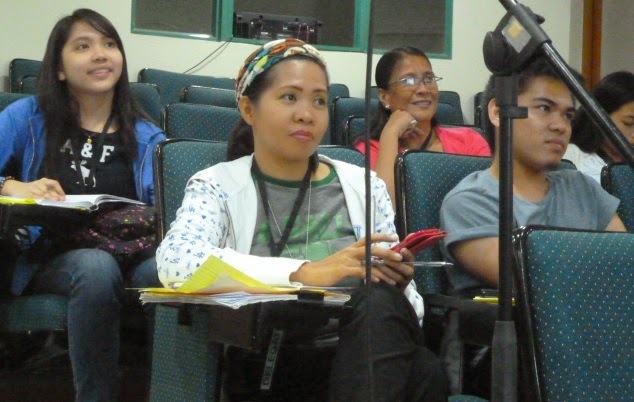 After the opening and plenary sessions on July 25, the delegates signed up to different workshops happening in different venues at the DLSU campus on SMC’s second day. DLSU Yuchengco Hall, venue of the FILCOLS workshop "Beyond the Grave: Copyright for Young Authors" and other SMC workshops. “Beyond the Grave: Copyright for Young Authors” is one of the workshops designed for photographers, writers, and artists held at Room Y507, Yuchengco Hall. The focus is on the property aspect of copyright and the fact that like land “pwede siyang ipamana.” Copyright can be inherited. Copyright can be transferred to a son, daughter, or parent by inheritance. Buenaventura explained that copyright is a bundle of rights made up of moral rights and material rights (or economic rights). Moral rights refer to the right of the author to put his/her name on the work and authorize changes to it. Material rights refer to the right of the author to earn from what s/he produced. The audience is made up of teachers, college, and high school students from different schools. The international documents are the Universal Declaration of Human Rights (UDHR) and the International Covenant on Economic, Social and Cultural Rights (ICESCR). UDHR is the common declaration for what humanity aspires for. It is not an international treaty but is very influential in the creation of international and local laws on fundamental human rights. ICESCR is an international treaty and enshrines some of the principles of the UDHR. “We are aware of the other voices in the debate which say that copyright should not be elevated to the status of human rights and should remain as IP rights,” Buenaventura said. But we strongly support the view that copyright is a human right. 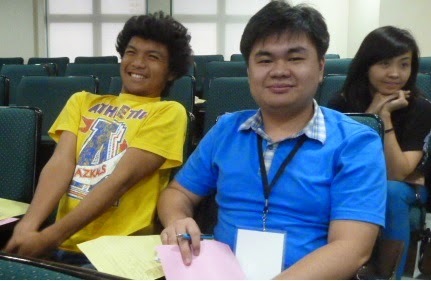 (l-r) FILCOLS staff Ricol Eseller, DLSU student Yeoj Magno, and author Bebang Siy. From article 23 of the UDHR, we read the right to work, free choice of work, and just remuneration so the worker and his/her family can live a life worthy of human dignity. DLSU students Jah Rosales, Mikhail Padilla, and Yeoj Magno. The “right to work,” “just remuneration,” “a decent living for themselves and their families,” and “right to form… and join trade unions…for the promotion and protection of his economic and social interests” are echoed in articles 6, 7, and 8 of ICESR. Delegates from various schools. 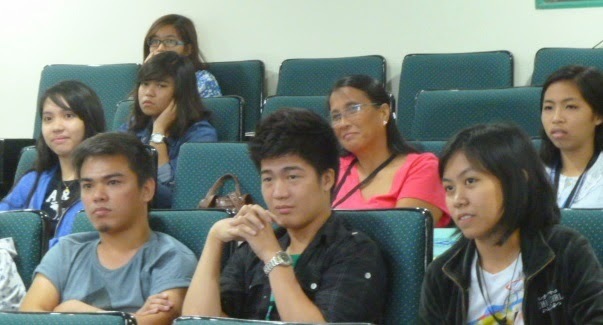 (First row, l-r) Adamson University delegates Franz Enriquez, Jan Súen, and --. (Second row, l-r) St. Paul's College of Makati delegate Ariane Lazaga, Mary Immaculate Parish Special School delegates Bella Corazon Tejano and Julia Buenafe. (Third row) Malayan College Laguna delegate Japs Concepcion. (Last row) DLSU delegate Marielle Zagada. 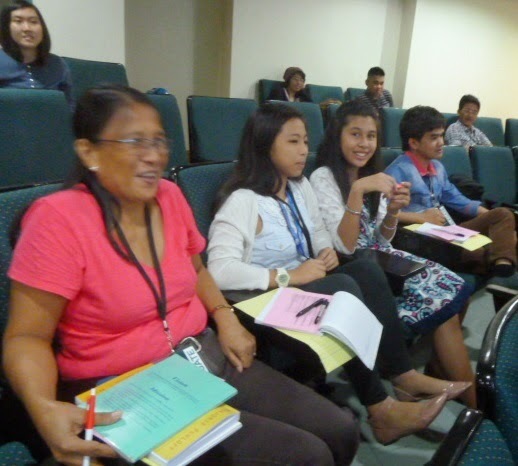 Other delegates were from high schools in nearby cities. Like manual workers, authors (writers and artists) have the right to work and receive just remuneration. They have the right to choose to work as writers or artists. Like manual workers, writers and artists have to fend for themselves and care for their families. Companies who fail to give the minimum wage violate the human rights of workers because it affects the livelihood of real people. If we look at writers and artists as intellectual workers deserving just remuneration for their cultural products so they can ensure for themselves and their families “an existence worthy of human dignity” then it’s easier see that copyright is a human right. The second part of the workshop was handled by author Bebang Siy. She encouraged the young writers with her own journey as an author. Some of Bebang Siy's works. 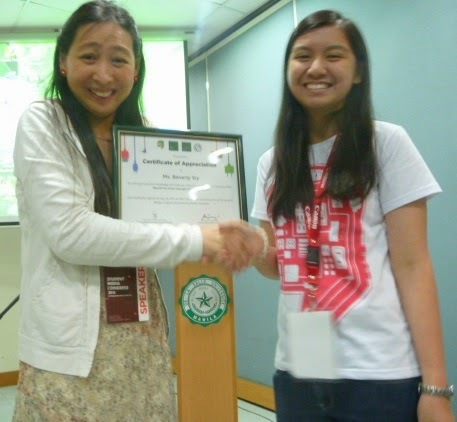 She encouraged the delegates to do what they love: take photos, create videos, or produce literary outputs. “But remember that the copyright to your work is your lifetime plus 50 years after your death. The protection is very long. The potential to earn is very long. Remember copyright is a bundle of rights. So don’t just sell all copyright to any publisher who likes to publish your work,” she warned the young listeners. As explained by Siy, it took many years and money to hone her writing skills. She invested in her own craft. People who use her work should pay just remuneration. The publisher should pay her proper royalties. If she is deprived of her right to earn from what she produced, then it affects her livelihood and her capacity to provide for herself and her son. Siy is producing works and she deserve to earn from her copyright. Depriving her of right to earn is a violation to her right to provide an "existence worthy of human dignity" to herself and her son. Copyright is a human right. Thus, when end users or consumers of photos, films, or literary works fail to pay properly they affect the livelihood of real people. Failure to provide just remuneration to authors and artists is a violation their human rights. 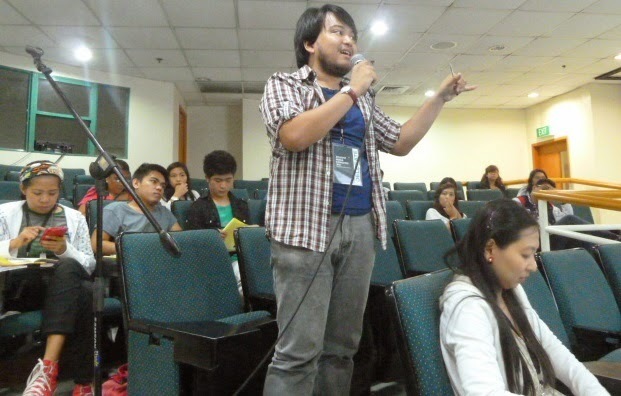 Solar News video editor Pocholo Felix asks questions on social networks and copyright. Web publishers who do not pay their writers or photographers violate human rights. The abuse becomes glaring when the web publishers themselves receive payment from their client corporations. These web publishers’ lack of regard for the livelihood of authors may be a form of modern slavery. Photos or videos uploaded or articles or literary works posted on social networks is available to the public to be seen or shared. To upload or post works online means the public can easily access it. Works publicly seen or shared on social networks may be said to be in the domain (or territory) of the public. Public domain is a law-created world where works with expired copyright are placed along with works that did not have any copyright to begin with (like works of the government). Works in the public domain may be freely used. Anyone can make money from these works like producing movies or TV series of Sherlock Holmes. But works posted or uploaded on social networks are protected by copyright. It is in the territory of the public but it is not in the public domain. Thus, photos, videos, articles or literary works on social networks should be respected. Copyright protection extends to works posted or uploaded on social networks. Copyright extends to the internet. One should not re-use these works like re-publishing them on a website or through physical publication like a magazine or book without first asking permission from the author or copyright owner. 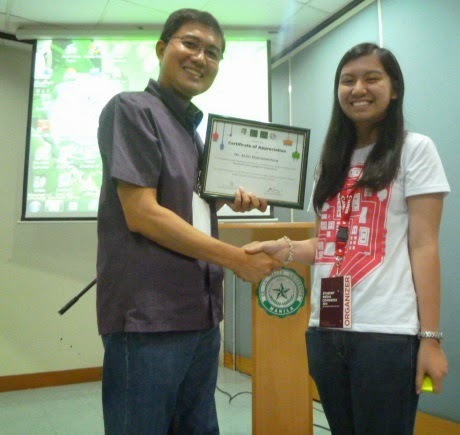 Alvin J. Buenaventura receiving his certificate of appreciation from SMC's Cloie Mananquil. Since authors have the exclusive right to their works (meaning they are the only authority when it comes to their works), they may give their works away for free. And no one, not even the law, is stopping them from giving their works for free. Some authors give away their works for free similar to the marketing style of “free taste” in supermarkets. But the ultimate aim is to whet the appetite of the consumers so they will buy in the future. After all, we should think of the livelihood of others. They need to earn like everyone else. However, one should not give away other people’s works for free unless the author gave him or her authority to do so. One should not be generous with the property of others. 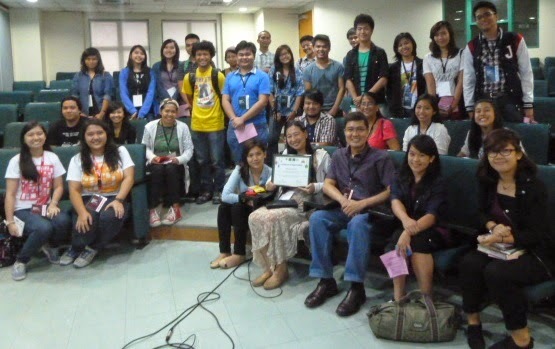 Workshop facilitators and participants for Beyond the Grave: Copyright for Young Authors. FILCOLS expresses its gratitude to Joanna Queddeng of the DLSU - Student Media Office, DLSU students Isabel Biyo (AB OC), Maria Insigne (AB CA), and Cloie Mananquil (AB OC). Text by Alvin J. Buenaventura. Photos by Ran Espiridion and SMC photographer. The article may be re-posted as long as the authors are acknowledged.